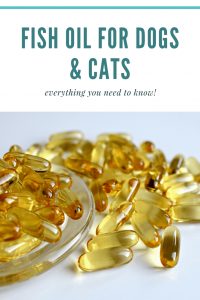 Fish Oil For Dogs & Cats: everything you need to know! Fish oil is the most common pet supplement on the market. Small wonder, when it has so many purported benefits! Lots of pet owners have questions about it, though, so we thought we’d put together a helpful primer to introduce all the key points. Fish oil does a wide range of things. To understand why, you have to look at what fish oil actually is. There are two different Omega-3 fatty acids in most fish oil supplements found naturally-occurring in fish. EPA and DHA are the abbreviated names, and they’re both underproduced in cats and dogs. So, we add them into their diet to supplement their health. The first big benefit is something you’ll probably be familiar with if you’ve been trying to improve your own diet! EPA (one of the two Omega-3’s in fish oil) is an anti-inflammatory compound. It reduces inflammation around all the major organs and does wonders for joint issues such as arthritis. Ideally, you can get some of this in a young animal’s diet to prevent those issues from developing. Even older pets who have some stiffness can see those symptoms turn around with supplements, though. Another anti-inflammatory benefit of EPA impacts pets’ skin. If your animals develop hotspots or have lots of itching and dandruff issues, you’ll see a marked improvement after a week or so on fish oil supplements. That’s one reason this is so important in households with allergic folks. As with all fat supplements, EPA promotes a healthy, glossy coat of fur. That means a perkier, better-looking animal, as well as less shedding for you to clean up. Win-win! You’ll give your vacuum a well-needed rest. Don’t expect shedding to disappear completely, though! You’ll still need a capable pet hair vac to clean up after your furry friends. Check out our home page to find our recommendations! DHA, the other Omega-3 in fish oil, has been shown in studies to have benefits in cognitive development among puppies and kittens. That’s especially pronounced if the mother is properly supplied with fish oil! While any study involving cancer is fraught, research is pointing to the suggestion that fish oil may slow the growth of common cancers in pets. We’re always hesitant to mention anything that makes a supplement sound like a miracle cure, but science is certainly looking good on this front! Is this all backed up by science? Yup! While research is always ongoing and evolving, there have been a number of conclusive studies pointing to fish oil’s benefits. We’re also beginning to understand more about what’s happening on a cellular level when fish oil enters the body. Omega-3’s such as those in fish oil are present in the bodies of all mammals (including humans!) at the cellular level. They signal cellular mechanisms to reduce inflammation and swelling, much in the same way we dampen those reactions using aspirin and other medication. In this case, the effect comes naturally as a result of a well-rounded diet. DHA in particular is an important component of nerve cells, so it’s essential for the development of a strong immune system in young pets. Most definitely. As with any supplement, it’s important to only use an appropriate dosage. Anti-inflammatory compounds like these Omega-3’s do inhibit blood clotting, so very high dosages can increase blood loss during injury, or make surgery hazardous. That takes quite a large amount, but you should still be mindful of the possibility. Similarly, these compounds can inhibit the healing process around wounds. That’s why you’ll want to cut your pet’s fish oil supplements any time they’re undergoing an operation or have been injured (for about a week, according to experts). Finally, while anti-inflammatory properties are very useful, you shouldn’t overlook the fact that some level of inflammation is a natural part of immune system function and the body’s healing mechanism. So, if you over-supply your pets with fish oil, you could impede their ability to fight off infections, cancers, and so forth. The lesson here is to use common sense, adhere to dosage instructions and always err on the side of moderation. What are the other concerns surrounding fish oil? Overfishing is a real problem, and fish oil requires a great deal of fishing. There are synthetic versions of these Omega-3’s available, but they’re not easily digested by animals. For the time being, fishing will be a necessary evil. Be sure to get your supplements and pet foods from companies who actively pursue sustainable sourcing initiatives and eco-friendly practices. Depending on where fish are harvested and how they’re processed, fish oils can contain toxins. This is certainly a valid concern. Fat cells tend to store things like heavy metals and PCB’s. That’s why it’s important to go with a reputable provider who uses third-party lab testing to verify the quality of their supplements and the sustainability of their sourcing. Check online for a Certificate of Analysis (usually abbreviated to COA). Reputable pet companies have been getting much better about testing thoroughly and publishing the results, but many still do not. There are also some preliminary studies showing that oxidized fish oils can produce free radicals which are associated with premature aging and cancer. However, the research wasn’t conducted on cats or dogs, and it points to a shaky correlation, not a causal relationship at all. So, we don’t think there’s anything to worry about. Only a few of the more “natural” pet magazines and publications have published any kind of warnings, and from what we can tell, no reputable vets or medical experts have expressed concerns. The first is to use a liquid supplement. It’s the way most of us go, since you can mix it into their food bowl at mealtimes. These supplements are easier to mask than a pill, at least with many animals. They’re also cheaper than capsules. You’re not paying for all that packaging! Make sure you place bottles with squeeze dispensers in sealable ziplock bags, though. You want to keep things airtight to prevent oxygen from degrading the supplements in storage. The second method is to go with some sort of capsule or pill. These are easy to find, and may be easier to get your pets to swallow. It really depends on the specific animal. You can mask one in peanut butter on crackers, or in something else your animal loves. They’re not so good for cats, though, since they’re fairly large. Thirdly, you can always find pet food with a healthy dose of fish oil included! Most of the organic mixes have some in there. It doesn’t get easier than this, since you don’t have to add a separate supplement into your routine. Check for the same kinds of certifications that you would on a separate supplement, though! Cheap pet food is bad for all sorts of reasons, but sketchy fish oil is as good a reason as any to avoid it. We suggest a Newman’s Own product, or Organix. Before starting your pets on any supplement, be sure to consult your vet! You should also pay careful attention to the dosing information on the supplement packaging. Run that by your vet, too, to be extra sure. For more of our advice and expertise, check out the rest of our buying guides! You’ll find links and featured reviews of the best vacuums for pet hair on our homepage.